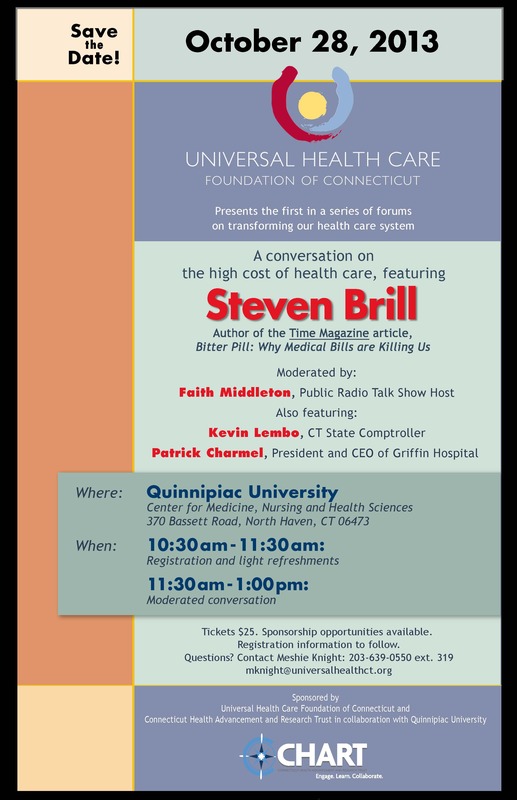 Mark your calendars and join us October 28 from 11:30 a.m. to 1 p.m. for the first forum in a new series, presented by Universal Health Care Foundation of Connecticut and its parent organization, Connecticut Health Advancement and Research Trust. It promises to spark one of the most important conversations about why our health system is falling short for people who need care, and what can be done about it. Brill, a high-profile, investigative journalist, “followed the money” in his piece, exposing the story behind ridiculously high medical bills. He will be joined by Kevin Lembo, Connecticut State Comptroller, and President and CEO of Griffin Hospital, Patrick Charmel. The conversation will be moderated by Connecticut Public Radio talk show host, Faith Middleton. It is presented in collaboration with Quinnipiac University and will be located at the Center for Medicine, Nursing and Health Sciences on the university’s North Haven campus. Below is a flyer we sent out as a save the date for the event, registration should open on our website next week. This entry was posted in From the Foundation and tagged Affordable Care Act. Bookmark the permalink.